We had a slumber party with my sister and nephew Friday night, so when Saturday morning came around we all jumped into the kitchen, including my 10 year old nephew and created a Brunch Feast. We divided up the menu to get this meal rolling. Mom tackled the bacon by cooking them in the oven. 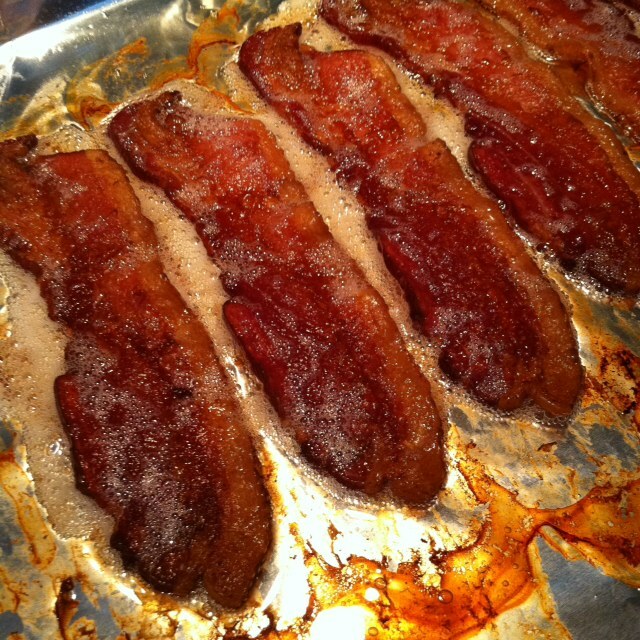 This method is so much easier than preparing them on the stove. No splattering, less mess... All she did was lay them on a foil lined baking sheet and put them in a 350 degrees oven for about 30 mins. Flip them over and put them back in the oven for another 30 mins. We like ours extra crispy, so it takes longer. I was in charge of the fruit because I like to get creative and fancy with the presentation. 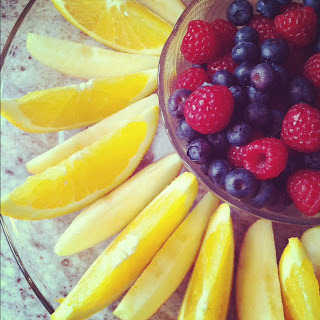 On a big platter, I arranged sliced apples and oranges around a bowl full of fresh raspberries and blueberries. 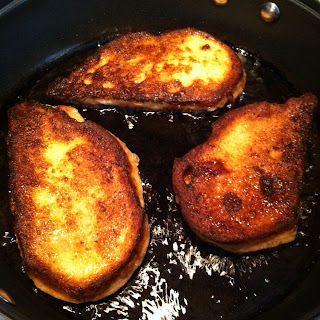 In the other corner, my nephew was learning how to cook my mom's famous sourdough french toast. Her egg mixture includes milk, sugar, cinnamon, nutmeg, orange rind and grand marnier. Thin, crispy and delicious every time. But, I, of course, ate the gluten free bread which was not the same! But after being soaked in egg and fried to a golden dark brown... it was tasty. My sister took on the breakfast potatoes which she cooked with red and yellow bell pepper and onions. 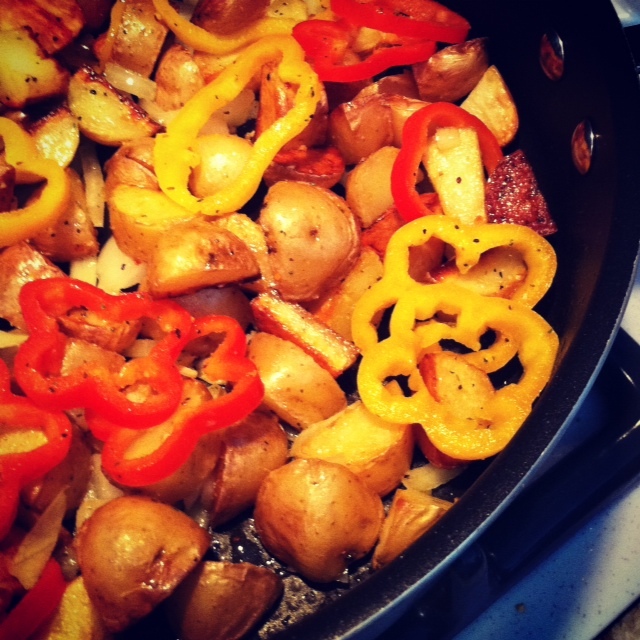 After she let the cubed potatoes brown and soften (in a pan with olive oil over medium heat), she threw in the chopped onions, sliced bell peppers and lemon pepper seasoning. After those soften, they're done! They're so pretty with the bell pepper shaped flowers. Wow!!! That looks absolutely fantastic! Does your mom have a recipe for the French Toast? It sounds incredible! If so, would you please post it? I would love to try it! I SOOOO enjoy your blogs, and I hope you never stop! How are you feeling since you started with the Gluten-free Diet? I hope you're doing better. Please say hello to the family for me, and wish everyone a Happy New Year! Yum, everything looks totally wonderful! Oh my gosh. I am so jealous of your brunch fest! Everything looks super delicious, especially the bacon and fresh fruit.